Looking out the porthole this morning it was if the weather couldn’t make up its mind. However the rain held off so we moved onto the water point and filled the almost empty tank. Three people certainly consume more water than two! The move was slightly complicated be cause the blunt end was leading. Actually what was a slightly complicated manoeuvre because even more complicated when Jan noticed six traffic cones in the bridge hole. Just to be safe I had to pass under the bridge in neutral. On reaching our new mooring the wheelbarrow tyres were extracted from the bow locker and used the hold Waiouru away from the bank. Jan went off to the shops for some retail therapy whilst Daniel headed for his driving lesson. Meanwhile the idiot on the boat sanded down the primer patches between the gunwale and the waterline before wiping the entire area down to remove the dust. After lunch one coat of gloss black was applied. The finish reminded me just how bad a painter I am. It’s obvious I’m impatient because there is nothing slow and deliberate about my brush strokes. The primer can be seen through the gloss black top coat which means another coat of black will be required. At least this part of the task isn’t unexpected! The more I look at the boat; the more rust spots I find! If the weather stays fine I might be able to lightly sand the new black paint and apply the second coat before the rain hot weather arrives in the afternoon. Unfortunately one of the downfalls of modern boat-builders in applying gloss to the upper section of the hull. It should be blacked like us working boats do as it is a vulnerable area liable to damage. Thus when you take some of the blacking off you just slap some more on, rather than having to go through all the stages of primer/undercoat/gloss, and trying to get the top coat matched to the existing. It also works out cheaper in the long run to apply a bit more blacking twice a year rather than having to replace the glosses area. Worth thinking about next time you black the hull, it will mean stripping all the gloss off, but in time it will come off anyway. I've been thinking of a different paint once the existing tin of gloss black has been used. 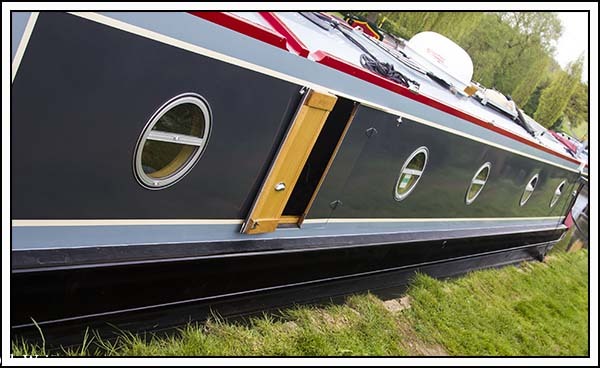 The boat blacking is two-pack epoxy which can only be purchased in 5 litre cans so I'm not sure blacking to the gunwale is a viable option?